Similar figures have the same shape but may have different sizes. Two triangles are similar if their corresponding angles are congruent and the lengths of their corresponding sides are proportional. If two angles of one triangle are congruent to two angles of another triangle, then the triangles are similar. Use your protractor and a straightedge to draw a triangle. Make one angle measure 45° and another angle measure 60°. Compare your triangle to those drawn by your classmates. Triangle drawn by you and the triangles drawn by your classmates will have same shape and different in sizes. Use the Triangle Sum Theorem to find the measure of the third angle of your triangle. 1. If two angles in one triangle are congruent to two angles in another triangle, what do you know about the third pair of angles ? They must also be congruent. 2. Are two pairs of congruent angles enough information to conclude that two triangles are similar ? Explain. By the Triangle Sum Theorem, the third pair of angles must have the same angle measure and thus are congruent, so the triangles must be similar. Explain whether the triangles PQR and STU are similar. The figure shows only one pair of congruent angles. Find the measure of the third angle in each triangle. Write the Triangle Sum Theorem for this triangle. Subtract 145° from both sides. Subtract 135° from both sides. Three Angles of triangle PQR are 45°, 100° and 35°. Three Angles of triangle STU are 45°, 100° and 35°. Because two angles in one triangle are congruent to two angles in the other triangle, the two triangles are similar. Explain whether the triangles ABC and DEF are similar. Subtract 128° from both sides. Subtract 119° from both sides. Three Angles of triangle ABC are 52°, 58° and 70°. 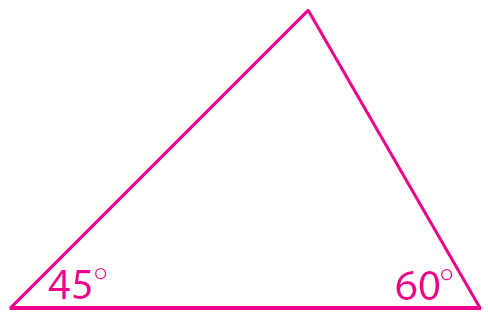 Three Angles of triangle DEF are 70°, 61° and 49°. Because only one angle is congruent, the two triangles are not similar. After having gone through the stuff given above, we hope that the students would have understood "Angle angle similarity".